High up on the Tuki Tuki terraces overlooking the river valley of the same name lies Kathryn and John Laughlin’s viognier vineyard. In addition to being a rather lovely thing to look at, it’s a spot that produces knee-slappingly lovely things to sip on. 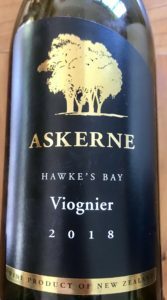 This new vintage hits that wow-inducing balance between zesty citrus, fabulous florals and creamy apricot and mango that I look for in good viognier (vee-yon-yay). Vanilla, jasmine, and a hint of white pepper make it luscious and luxuriously textured with spicy nachos. Love it!